Specialized Productions Inc. was selected as Valley Forge Casino Resort’s exclusive owner’s representative to design and implement a state-of-the-art, multifaceted Audio Visual system and create compelling digital signage content for all digital screens on property. The audio visual system features SVSi Volante streaming, BSS, Crestron and CoolSign in SPI’s design. 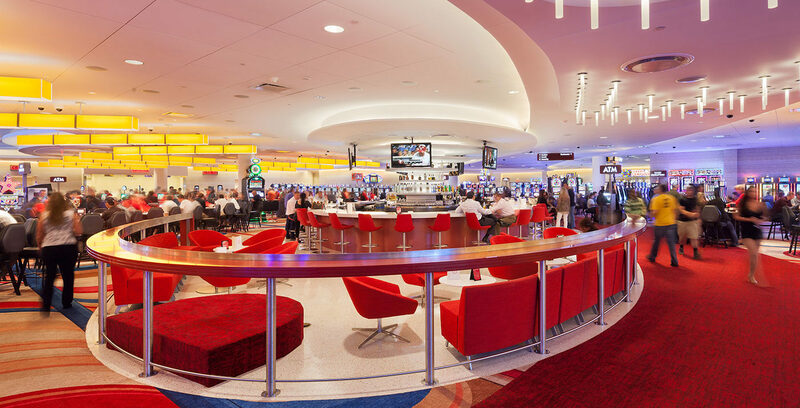 The digital signage design includes the 28-screen feature video wall, digital menu boards at the micro-restaurants, slot top denomination signs, outdoor LED Pylon signs and various digital displays throughout the casino floor and Player Services area. SPI continues to create the custom, branded content for all digital displays on property, including the 28-screen feature video wall, iView screens (on all slot machines), digital menu boards, redemption kiosks, membership kiosks, slot top denominations, outdoor LED Pylon signs, hotel in-room channel, night club and Player Services displays. Valley Forge Casino Resort is a full-amenity gaming resort, featuring 600 slots, 50 table games, 486 guest rooms and suites in two hotels, and a 100,000-square-feet convention center. Guests find countless culinary delights in seven restaurants, including the freshest steaks at Pacific Prime, a true Italian experience at Viviano, and tremendous Asian cuisine at Asianoodle. The Center Bar is the center attraction on the casino floor, and the resort’s chic nightclub, 7, sets new standards for service and features the area’s hottest DJs.